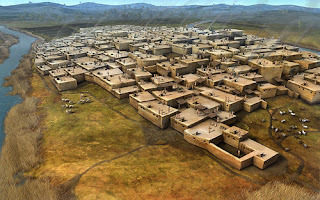 Catal Huyuck was a Neolithic city. It was constructed near Konya, in south-central Turkey from about 6700 BC to 5650 BC. These people lived in mud-brick houses that were rectangular in shape, and typically entered from roof level by a wooden latter. 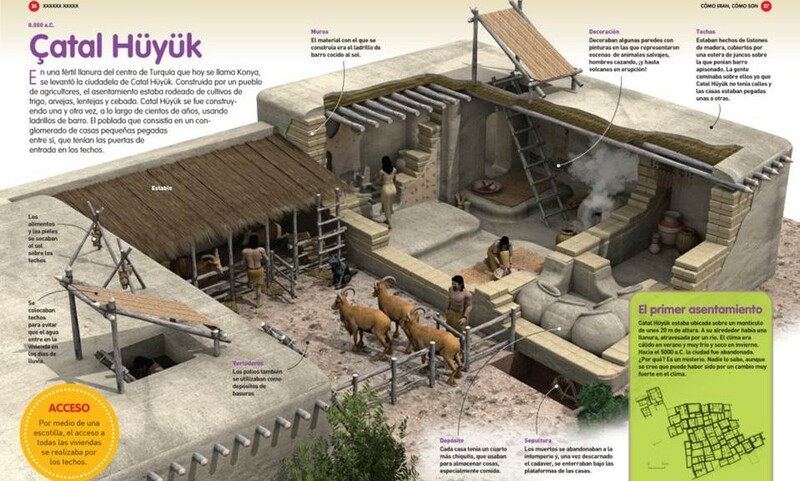 Most houses had platforms for sleeping, sitting, or working, along with a hearth and an oven. The rooftops were the most common area for activity, especially considering that the interiors of the houses had poor light and ventilation. Because the plans and sizings of all the buildings are so similar, it is uncertain which ones were ordinary places and which ones were sacred. There are the questions; Copy them in a word document and add the answers; when finish, send it as attached file to blogeducativo08@gmail.com. I will answer you back with the corrections as soon as possible. - In which modern-day country is Catal Huyuk? - In which stage did they were living in? - Which material was important in its economy? - What did people use for building houses at Catal Huyuk? - Which examples of art did they have?